Here is a good shot of Deep Purple from the archives, courtesy of EMI (Sweden). It was taken in Gothenburg, March 21 1975, most likely at the hotel or at the arena that they performed in on this visit (Scandinavium). The guy in the middle was a EMI bigshot who wanted to be in the picture (I guess). 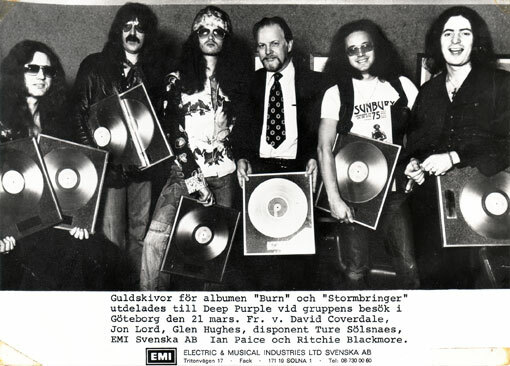 The Gold Records were for “Burn” and “Stormbringer” and it is kind of nice to see Ritchie Blackmore smile is it not? Maybe somebody fell into a cake behind the photographer? This was his last tour with Deep Purple in the 70´s, the first Rainbow album was already in the can, waiting. I recall getting a copy of the show they played that night on a C90 cassette as a kid and it was brilliant. “The Gypsy” is outstanding. Ian Paice was at the top of his game, the band was on fire. I always felt that the first Rainbow album should have been the last MK3 album, stuff like “Man On The Silver Mountain” is so much Deep Purple it hurts. But then, I guess it was only a natural progression. Life moves on, so does careers. MK3 didn´t last very long, but it was a great band.